An electric affair: Activate 2017 rallies the Cyclotron Road community for the second year in a row. Cohort Three innovator Adam Vaughan enjoys the atmosphere at Activate 2017, our second annual demo day event. Early on the morning of September 28th, 2017 a refrigerator, a household window, a Coleman propane burner and a variety of other objects (a box full of vintage hard drives, a kitchen blender) were hauled into the Grand Ballroom at Oakland’s Scottish Rite Temple, where they were set up on the floor and on tables around the edges of the room. What would appear to be an appliance vendor’s convention or a swap meet was in fact a showcase for the visionary innovators we support at Cyclotron Road. The objects at hand were parts and props for demonstrations of the transformative energy technologies they aspire to develop. Around lunchtime, some of the most respected investors, entrepreneurs, philanthropists, and industry executives in hard tech swarmed in to learn, get inspired, and forge new relationships with our innovators and each other. Standing room only at Oakland's Scottish Rite Temple. 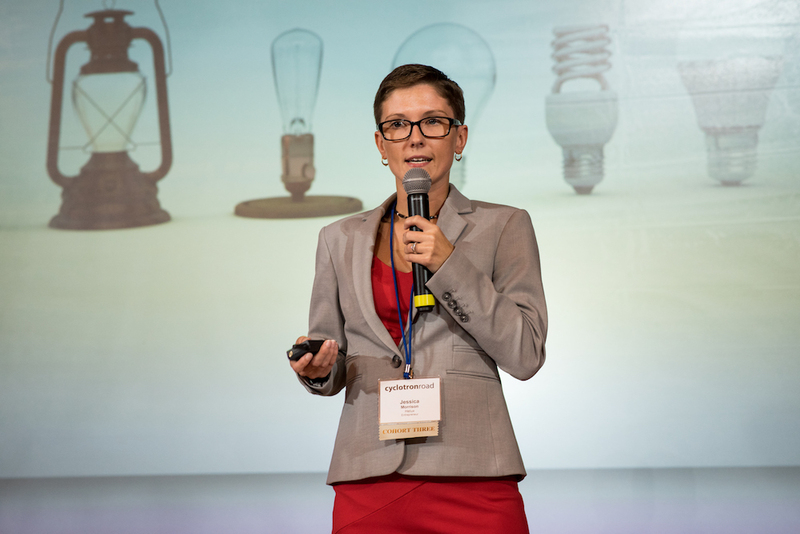 Activate 2017 was the second such event we’ve held to bring together our broader stakeholder community and give them a chance to hear from our innovators and engage with their vision for future technology. Like last year’s gathering, the event featured short pitches from all of our active fellows, demo tables for every team, and plenty of time for open ended conversation among the guests. 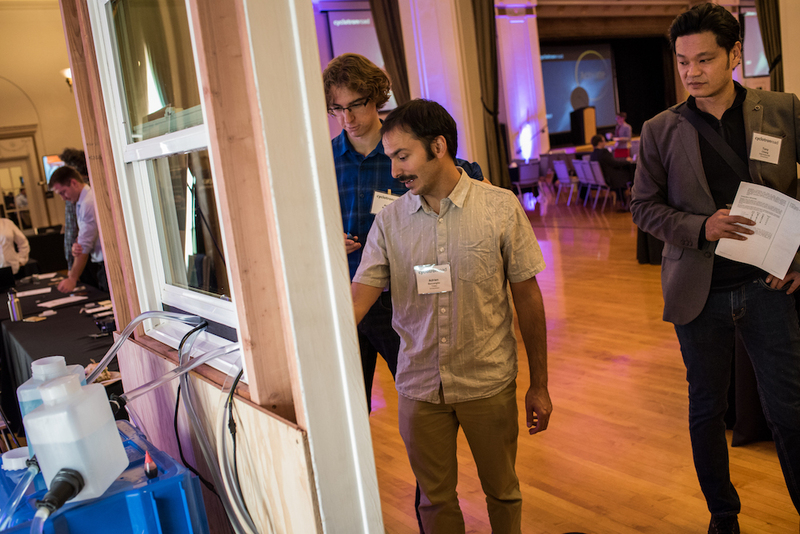 Treau cofounder Adrien Benusiglio and ARE Fellow Adam Rutkowski adjusting their demo as Intermolecular CTO Tony Chiang looks on. Treau’s window unit demonstration of their polymer-based heating and A/C unit. Cofounders Vince Romanin and Adrien Benusiglio worked tirelessly to pull this demo together in the weeks leading up to the event. Guests were able to feel hot and cold air emanating from the unit, which operates using a first-of-its-kind plastic heat exchanger that has the potential to be more energy efficient, lower cost and lighter weight than existing technology. Cyclotron Road operations lead Melanie Miller tests an unmarked battery using Feasible's acoustic diagnostic system. Polyspectra’s creative use of a kitchen blender to demonstrate the toughness of their new 3d printing resin—COR Alpha (see below)—relative to conventional materials. As in the video from polyspectra's website at right, guests were able to pulse a blender and watch Polyspectra's 3d printed "dog bone" rattle around nearly unscathed, while parts printed with conventional printing plastics turned to crumbs. The demo definitely made the point (and a bit of a mess…). 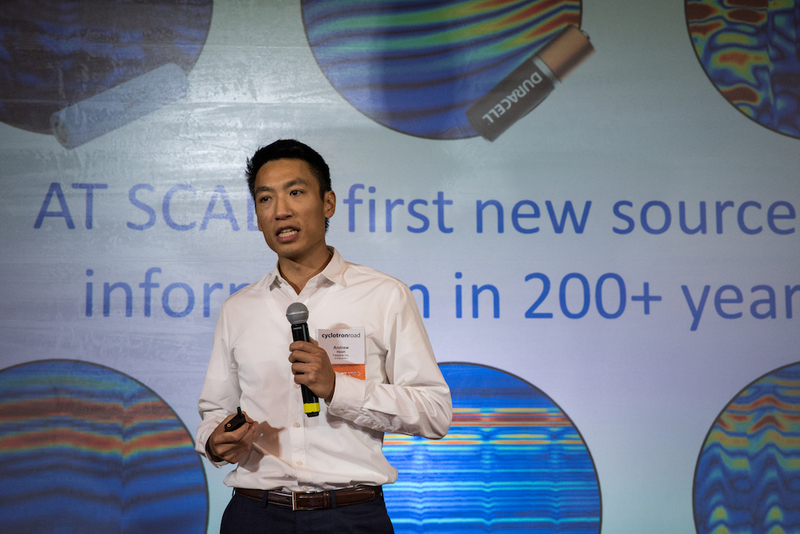 Total attendance at Activate 2017 was well over 300 people, nearly 100 more than last year, including more than 80 investors and more than 40 representatives from industry. More notable than the guest count, though, was the level of engagement, as energized conversations went on continuously over the course of the four hour event. One of our primary goals for Activate was to catalyze new engagements with potential partners for our teams. On that count the event seems to have been a success: surveyed more than two months after the event, four out of five of our teams are still actively engaging with a potential investor, funder, partner, or team member who they met for the first time at Activate 2017. Colin Bailie and Chris Eberspacher, cofounders of Iris PV, speak with a guest at their booth. Opus 12 cofounder and CEO Nicholas Flanders, who announced the company's first product advertisement in Gas World magazine. Visolis founder Deepak Dugar, who highlighted his teams progress in scaling up their bio-based chemical production to 9,000 liters. Polyspectra founder and CEO Raymond Weitekamp, who launched his company's first commercial product—dubbed COR Alpha—on stage at Activate. Cyclotron Road executive director Ilan Gur kicks off the event. Melanie Miller kept the event moving with her expert bell-ringing skills. ARE fellow Emily Ghosh walks two people through Marigold Power's thermophotovoltaic demonstration. Marigold Power founder David Bierman makes his case for thermophotovoltaics. 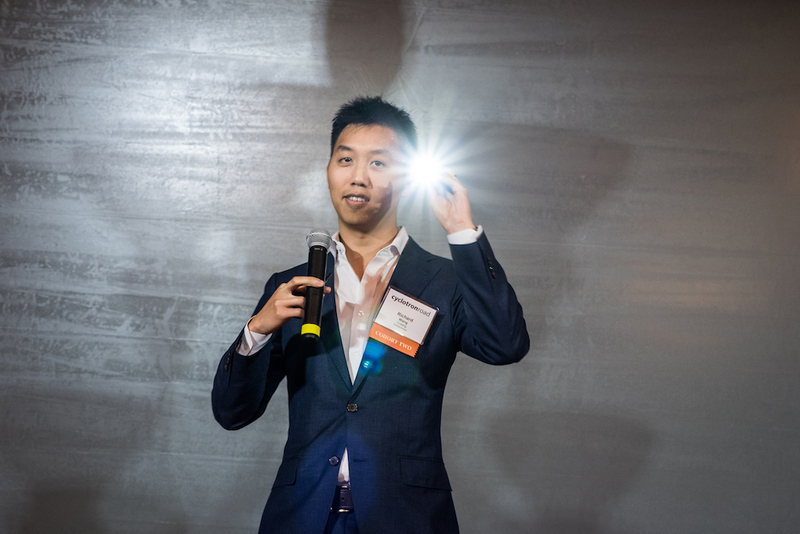 Cuberg cofounder Richard Wang showing off a flashlight powered by a prototype lithium metal battery.